Firefighters need fast access to clear hydrants when there is a fire. Please help us keep you safe by uncovering your hydrant. 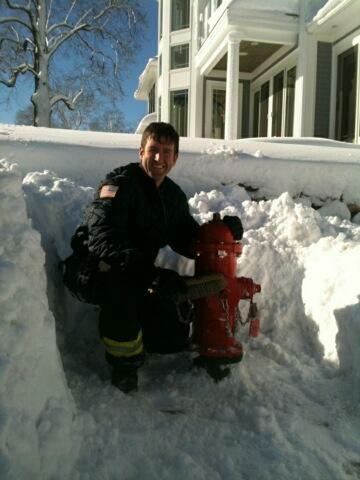 The Beverly Fire Department is making a plea for homeowners to clean the hydrants near their homes. Firefighters are currently out shoveling hydrants from previous storms and will be out again tomorrow shoveling hydrants from the expected storm. There are still hundreds of hydrants across the city buried from previous storms. When firefighters go into a burning building, the water they bring is their greatest weapon. Delays getting water on a fire inevitably lead to greater property losses from fire and increased potential for personal injury. Over the last weeks, Beverly firefighters have responded to a spike in fires including two that caused significant damage to homes. At both of those fires, firefighters spent precious time trying to get water from buried hydrants when they could have been putting out the fire. This is particularly important in a climate where communities are often fighting fires with fewer firefighters. During storm events, the Beverly Fire Department will increase staffing levels as response times are slowed and emergency calls can increase. Typical storm staffing in Beverly is 13 to 15 firefighters where there are 10 on duty during normal operations. Help us protect you and your homes, give us quick access to the water we need to put a fire out! At 2152 on Saturday evening the Beverly Fire Department responded to a call from a resident at 25 Chipman Road for a report of a fire in an electrical outlet. Upon arrival the crew of Truck 2, Lt. Donald Philpot and FF. Keith Rivers found fire in the wall above the fireplace burning through the outlet. They then had the occupants evacuate the house. A hose line was stretched into the living room and the wall was opened to expose the fire while the crew from Truck 1, Cpt. James Maggiacomo and FF. Steve Grant, went to check for fire on the second floor. After the visible fire in the living room was extinguished flames were found in the attached garage area and the second floor bedroom. The crews from Trucks 1 and 2 working with Lt. Eric Fowler and FF. Brian Latullipe extinguished the fire in the garage area and opened the wall and ceiling in the bedroom to extinguish the fire there. Engine 1's crew was laying a supply line to Truck 2 and had to deal with a hydrant which was frozen shut, snapping one hydrant wrench in half in the process. Beverly's Fire Investigation Unit was called to the scene and determined that the cause of the fire was a faulty fireplace/chimney and not the electrical outlet. Damage to the home was estimated to be $25000.00. The Beverly DPW and Northeast Regional ambulance also responded to the scene and mutual aid coverage was provided by Wenham and Manchester. Deputy Chief William Petrosino was the officer in charge at the scene. No injuries were reported, fire crews were on scene until 2320.
were still buried under snow banks and had to be dug out in order to be used. with Swampscott functioning as the RIT (rapid intervention) team. determined that the cause of the fire was electrical. injuries reported and one family cat was pulled from the building by FF Jon Palm. The Beverly Fire Department has been awarded a grant through FEMA�s Assistance to Firefighters Grant Program. The project will provide firefighters with new equipment associated with their aging self contained breathing apparatus (SCBA). The SCBA consists of a harness, cylinder, high and low pressure hose systems, regulators, Personal Accountability system, and mask. The current SCBA are nearly thirteen years old and are becoming increasingly expensive to maintain. Although this grant will not replace the entire SCBA system, it does address several of the key components. The total cost of the project is $97,971.00 with the grant program paying $88,174.00 and the City paying the remaining $9,797.00. The equipment associated with the project includes new face pieces with voice amplifiers and new carbon composite cylinders. The cylinders allow firefighters to carry much needed air into a fire so that they can work in the hot, smoky conditions. The face pieces provide firefighters with a tight seal to insure that no smoke gets into the mask while a firefighter is working inside a smoky house and the voice amplifiers help to keep firefighters safe by amplifying what they are saying to the firefighters around them. Communication has always been difficult inside of a burning building, these amplifiers will greatly assist the interior firefighting crews understand what they are saying to each other inside the building. The equipment being purchased has been chosen for its compatibility with both the current SCBA system and the new SCBA systems that are currently being produced. The cost to replace all of the current SCBA systems would be more than $250,000. The Department will look to replace the remaining portions of the SCBA by 2015. Grant approval was received on Friday, January 14, 2011. All of the new equipment should be in service with the Department by May. For more information on the Assistance to Firefighters Grant program, please click on the link below. Firefighters have been busy during the storm responding to reports of downed power lines and related electrical problems. The department would like to take this time to request that everyone stay away from any lines that they might see in the street or sidewalk. All downed lines should be treated as live power lines to avoid electrical shock. We would also like to ask that everyone watch out for their neighbors for the next few days. If you have a neighbor that can't shovel themselves out, please give them any help that you can and make sure that they are alright. The snow is heavy and wet. Make sure that you are healthy enough to get out and shovel before you over exert yourself. Marine 1 has hit the water! The Beverly Fire Department's new fire boat has undergone its first round of sea trials in Washington. Fire Department personnel will be traveling out to Washington for an final inspection on January 18. After the inspection, the boat will be shipped to Beverly. This year, in an effort to curb illegal burning and reduce incidents of improper permitted burning, the Beverly Fire Department is changing the way it issues its open burning permits. In years past, a homeowner would simply call the Department the morning they wished to conduct the burning and a permit would be issued free of charge over the phone. Now residents will have to come in to the station once a year during burning season to file a seasonal permit with the department that will cost them $10.00. After the initial issuance of the permit, the owner will only be required to call with the permit number to request permission to burn on additional days. Permission will be based on weather and environmental conditions. The new permitting system will bring the Department in line with other surrounding communities and will provide the person to whom the permit is issued with a better understanding of the requirements that go along with an open burning permit as well as a better likelihood of conducting the burning in a safe manner. Although open burning can be an efficient way of removing some yard waste, people often forget that fire can be extremely unforgiving when attention to detail isn�t paid. A momentary lapse can result in serious personal injury or property damage. In addition to the safety concerns are limitations to what can be burned for environmental reasons. In Beverly, you can begin to burn after 10 am and have to have the fire out by 3 pm. The fire must always be attended and the responsible person should always have some extinguishing method handy to keep the fire from getting out of control. Fires should be kept manageable and children should never be allowed near the operation. Remember to start the fire safely. Never use gasoline or other flammable liquids to start a fire. And always remember to call 911 as soon as you feel a fire might be getting away from you. It is unsafe to burn during high winds. Use common sense and don�t wait for the fire department to contact you that is has become unsafe to burn. Sudden wind change is the how most open burning gets out of control. April is usually the worst month for brush fires. When snow pack recedes, before new growth emerges, last year�s dead grass, leave and wood are dangerous tinder. Winds also tend to be stronger and more unpredictable during April. Unfortunately many people wait until the warmer weather to conduct open burning. Open burning releases large amount of carbon dioxide, other gases and solid substances directly into the air, which can contribute to respiratory problems. Disposal of natural materials is best for the environment when they are used again in a different form. Try chipping or composting tree limbs, brush or forestry debris to use as landscaping materials.